Bose recently demoed its DeltaQ Arrays with live performances at Millennium Studios in Bedford, U.K. Audio has come a long way in the last decade or so. Despite continuous gains in capture and reproduction technology pushing the limits of high-fidelity sound, until recently, issues in practical use still left a lot to be desired—more flexibility in loudspeakers, better coverage in conferencing microphones, and easier manageability, to name a few. But by adding computing power and digital signal processing to the equation, manufacturers have been creating systems that sound great and work great, too—solving age-old problems and pushing the limits of possibility in audio. Here are five such problem-solving audio solutions. Astro Spatial Audio (ASA) improves deployment of object-based, 3D immersive audio in live entertainment and installed sound projects, while also delivering the ability to electronically alter room acoustics and track objects on stage. The technology is based on the SARA II Premium Rendering Engine, which utilizes SpatialSound Wave (SSW) technology, developed by the Fraunhofer Institute for Digital Media Technology IDMT, to turn audio files into audio objects with added intelligence. The result is a fully scalable 3D audio solution with up to 64 MADI or 128 Dante-configurable network pathways, all of which are assignable to at least 32 audio objects, and all made easy to use via a browser-based GUI. ASA can be found in venues as varied as houses of worship, planetariums, theme parks, museums, nightclubs, cruise ships, and theaters. Commissioning is currently underway at the world-renowned Maly Theatre in Moscow, where a full ASA solution has been implemented. Other projects include The Birds Eye jazz club in Basel, Switzerland, the Zurich Opera House, and a recent purchase by New Jersey’s Masque Sound. Conventional line-array loudspeakers typically offer only a single horizontal and single vertical coverage pattern, which can compromise audio quality and array efficiency. DeltaQ next-generation array technology is designed to enable top-class audio quality, for every seat, and for almost any venue size or shape. With a choice of up to 42 coverage patterns, DeltaQ technology can improve audio quality versus conventional line arrays by more precisely directing sound energy to the audience and away from unwanted reflective surfaces. Proprietary designs improve acoustic summation to virtually eliminate array interference “seams” between modules and improve overall array coherency. Additionally, DeltaQ technology allows arrays with reduced box count, without compromising vertical coverage, to reduce rigging weight and improve sight lines. DeltaQ array technology is available in Bose Professional RoomMatch and ShowMatch loudspeaker systems. 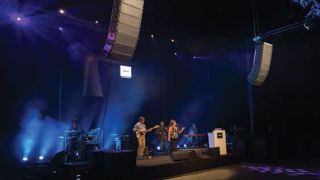 Having just begun shipping, Bose Professional recently held demonstrations of the DeltaQ array loudspeakers featuring live performances at Millennium Studios in Bedford, U.K. The C303W-RF is a tri-element array hanging microphone designed for unobtrusive, all-round pickup necessary in places such as board rooms, conference rooms, court rooms, and other venues. This new product features three cardioid capsules covering a 360-degree pickup pattern. Each independent capsule is RF immune, will capture approximately 120 degrees, and is optimized for speech intelligibility. The C303W-RF is a non-proprietary microphone array, which makes it easier to install, and also compatible with all popular DSP units. When table microphones are not an option, the C303W-RF offers an alternative to bring the microphone capsules closer to participants, with a minimal footprint in the conference room. Canadian integrator sparkAV recently completed an installation at the Toronto headquarters of ole, a rights management company, involving the Clockaudio C303W-RF. Since the meeting rooms at the facility featured many hard surfaces and furniture that could not accommodate in-table boundary mics, the sparkAV team decided Clockaudio’s hanging microphones would be the best fit. The client, a music company, is very happy with the audio quality that the C303 provides, as well as the ability to leverage its VoIP and bridging platforms to easily make clear calls. Chesapeake Energy Arena in Oklahoma City, OK recently installed Fulcrum CS121 passive cardioid subwoofers in a projected completed by Ford AV. Fulcrum Acoustic’s latest innovation, Passive Cardioid Technology, was developed to overcome the excessive rear low-frequency (LF) radiation that is a major performance challenge of many loudspeakers. Conventional loudspeakers become less directional with decreasing frequency—with rear radiation approximately equal to the sound radiated forward to the audience at their lowest frequencies reproduced. Fulcrum’s Passive Cardioid Technology reduces rear LF radiation without the extra cost and space requirements of active cardioid systems—with a single passive cardioid speaker doing the work of an active cardioid array. Passive cardioid technology achieves higher directional control mechanically within the enclosure in less than half the space required for active cardioid array systems. Passive Cardioid Technology was first introduced in Fulcrum Acoustic’s FL283 Line Array Module, is the basis for its Cardioid Subwoofers product line, and is being continuously developed and evolved into new applications. Chesapeake Energy Arena, home of the NBA’s Oklahoma City Thunder, recently installed Fulcrum CS121 passive cardioid subwoofers in a project completed by Ford AV. As the arena has a large central scoreboard that precluded the hanging of subs directly over the center of the court, Ford AV was forced to hang them around the scoreboard’s perimeter, and chose Fulcrum’s cardioid technology to minimize interference between arrays. The Nureva HDL300 system aims to redefine audio conferencing with patent-pending Microphone Mist technology, which utilizes a DSP algorithm to fill a room with 8,192 “virtual microphones.” This results in even coverage for all participants, regardless of their location or the direction they’re facing. Featuring 12 omnidirectional microphones, two built-in speakers, and a processor 15 times more powerful than conventional systems, according to the company, the HDL300 processes sound from all 8,192 virtual microphones simultaneously and focuses on the best source. The HDL300’s wall-mounted microphone and speaker bar is fully plug and play, with a self-calibration feature, so no technical setup or room adjustment is required. Due to begin shipping this year, the HDL300 is well suited for small- to medium-sized meeting spaces where a turnkey, high-quality conferencing solution is required.